We were lucky enough to get our hands on one of Heston Blumenthal’s Multicooker’s by Sage recently. Here’s how we got on. If anything, the literature accompanying the Multicooker doesn’t do justice to what it’s truly capable of; nor the results you can realistically expect. The packaging is smart and luxurious, but it’s not until you’ve used it a few times you realise it’s true potential. We reviewed the item over a five day period and used our own hob once, to cook spaghetti. This Multicooker is so incredibly versatile that you’ll wonder how you ever got by without one. There are five settings to choose from on the super-straighforward control panel which sits at the front of the unit: Risotto, Sautè/Sear, Rice/Steam, Slow Cook (Low) and Slow Cook (High). You know how much hassle it is to make Risotto, with it’s endless stirring, incessant stock pouring and perpetual tasting? You can forget all that, because other than making sure you’ve seasoned everything properly it’s almost as easy as making toast. The Multicooker cooks Risotto perfectly each time, by utilising it’s clever heat element so you don’t even need to stir it. Absolute genius. And no, it doesn’t end up dry and desiccated either. Just perfectly cooked, creamy Risotto. The Sautè/Sear function does exactly that; cooks meat and/or veg so it’s nice and soft and ready for the slow cook process. It gets to exactly the right temperature too, so you save time adjusting heat settings etc. 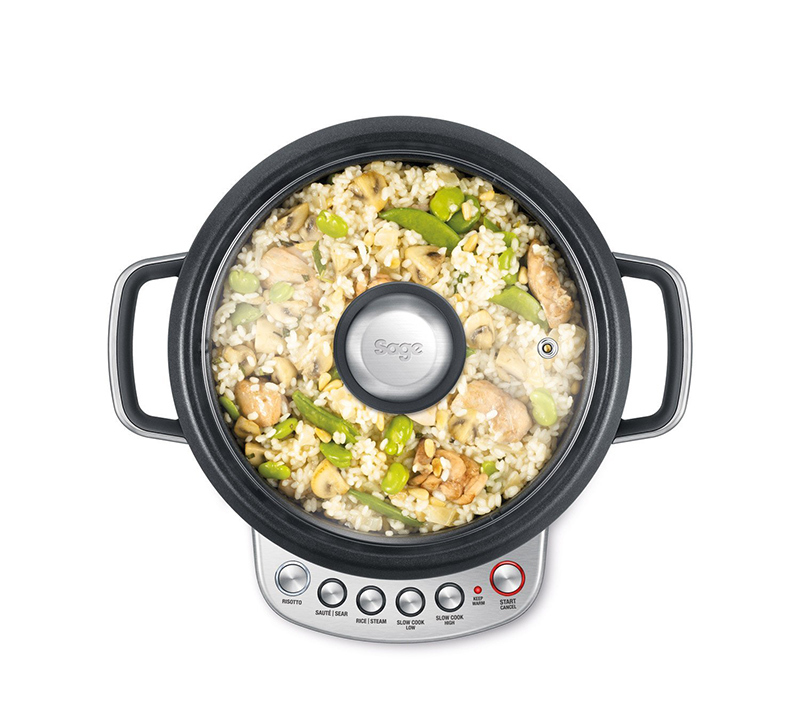 Just like the Multicooker delivers the goods in the Risotto department, it does exactly the same for rice. Perfect every time. You can also use this setting to steam vegetables so that they’re nice and crunchy and still packed full of the goodness Mother Nature intended. The Slow Cook (Low) setting is absolutely perfect for stews, casseroles, curries, tagine-style dishes or anything else that tastes better the longer you leave it. The built-in timer for this setting cooks the food for around 7-8 hours before switching to the ‘Keep Warm’ setting which lasts for around 45 minutes before shutting off altogether. We tried Beef Stew and Dumplings, Lamb Bhuna and Sausage Casserole – all of which were fantastic. The meat was tender, the vegetables cooked perfectly and the sauces were rich and tasty. We got into the habit of preparing dinner at around 10am so that come dinner time, our evening meal was ready to serve. The smell of home cooked food filling the house all day is just an added bonus! The Slow Cook (High) setting is great for Spaghetti Bolognaise (not the spaghetti itself unfortunately), Chilli Con Carne, Leek and Potato Soup and Chicken Paella. For anything that does not require meat to be slow cooked, this setting is best. Cook time is 3-4 hours, before again switching to the ‘Keep Warm’ setting. Whilst cooking, the Multicooker never becomes too hot, so you needn’t worry about burning yourself. Once your meal has finished cooking, the convenient cooking bowl can be removed and placed onto the table for serving, or into the fridge to keep until the next day. When it’s time to wash you simply place the bowl only into the washing up, and give the rest of the unit a wipe down. There’s really no additional mess to worry about at all. For busy families, the Heston Blumenthal Multicooker is an absolute must, especially considering the sub £100 price tag. It works perfectly every time, and takes the hassle out of preparing real home cooked food. We’ve not come across anything on the market that is as sturdy, easy to use or as well designed as this device, and it’ll certainly be a permanent addition to our kitchen at home.